Once listed as one of the top 10 most influential people on the gulf state of Bahrain's Power List, Abdulrahman Jawahery credits his studies at LSBU in the 1970's with giving him the practical skills that have formed the basis of his career success. On Monday (6 October) he received the title of Honorary Doctor of Engineering at LSBU's graduation ceremony for students of Engineering, Science and the Built Environment, held at London's Royal Festival Hall on 6 October. After graduating in 1977, he returned to Bahrain and took up a job as an engineer with Gulf Petrochemical Industries Co (GPIC). He rose steadily through the ranks, taking on more and more senior management roles and ultimately becoming general manager of the whole company in 2005 and president in 2011. Under his leadership, GPIC has become a beacon for environmental awareness and sustainable business practices in the region. His passion for learning and self-motivation is an ethos he shares across with his staff. "Like London South Bank University, we expect people to be hungry to learn and develop," he says. "That's the kind of spirit I want to foster." Supporting charitable causes is another passion that Mr Jawahery has embraced in his time at the helm of CPIC. He estimates the annual donation total of the company to be in excess of to be more than US$7 million. Since 2002, Mr Jawahery has also been a member of the Upper House of the Bahrain parliament, working to push through legislation on health, safety and the environment. He also sits on a number of international and regional NGO boards involved in the same issues, giving GPIC an opportunity to share and build knowledge on sustainable development and responsible engineering practices. 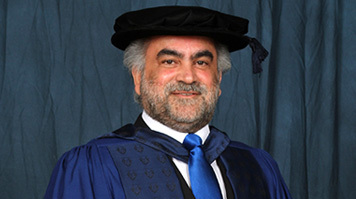 LSBU Vice Chancellor Professor David Phoenix said: "For his energetic and imaginative approach to business, his dedication to promoting the sustainability agenda, and his impact on the lives of young people in Bahrain and beyond, the university is delighted to award the title of Honorary Doctor of Engineering to Abdulrahman Jawahery."